1. How do you rate this entire Series 4? 3. Which method will you approach when you buy individual Series 4 packet? It's me again! I hope you are feeling excited like I do as I shares with you one of the very successful and highly anticipated LEGO product line in 2011. Without further ado, let me get myself ready with you together on this very first of a kind journey of the most complete detailed LEGO Collectable Minifigures Series 4 review ever. Before we move into that, I had prepared a very short thank you note for the people involved. 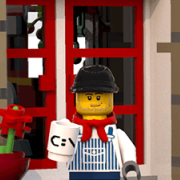 I will like to extend my greatest thanks to The LEGO Group (TLG) and Eurobricks Staff for continuing and giving me this exclusive rare opportunity to review one of the very first Collectable Minifigures Series 4 release in the global LEGO Community. It truly means a lot to me for being able to continue such a tradition for almost a year. Lastly, this is a collaborative review and was actually inspired by a special someone named, Belun, during the photo taking session. 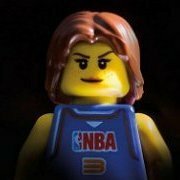 Without all of the support of everyone including the Eurobricks Community, this will never had be possible. Thank you so much! Looking back last year where Series 1 and Series 2 dominate the LEGO community by re-creating more LEGO fans to buy purely "Collectable Minifigures" without any building bricks in your sealed packet. While in 2011, we are expecting to see not only Series 3 readily available in January and more waves like the upcoming Series 4 in April and Series 5 in August. Do you still remember the early Series 4 poll statistics? Perhaps, it's time to review your vote once more especially after the end of this review. This time, TLG adopts the bright orange as the theme packaging for this series. Not sure how many of you out there appreciates the original box's packaging. Here are some of the image links where I have attempted to take different angles. Our new objective is to complete a set of 16 unique minifigures for Series 4! The LEGO Collectable Minifigures Series 4 is definitely one of the most highly anticipated series among the current releases. 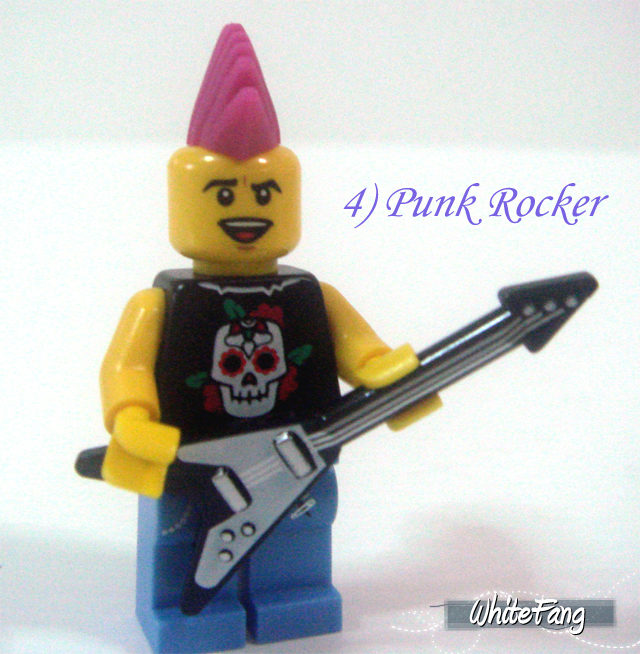 Very few Series 4 minifigures are actually considered as fillers while more attention is actually focused on the new minifigures relevance and integration of your current LEGO collection including the newly designed accessories like the electric guitar, palette, fan, etc. 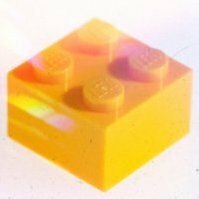 I am very confident that Series 4 will be a brand new milestone for the LEGO Collectable Minifigures era. It appears the colour themes for the respective series packets complement each other in a nice looking manner with the contrasting yellow, blue, lime green and orange. All of which are considered to be bright captivating colours to provide visual appealing for consumers. I believes the main concern of many of you out there is the identification process of the Series 4 packets. Unfortunately, with the de-identification of the Series 3 packets and forth due to the removal of bar-codes, we have resorted to the use of dotted codes which was cracked before. It can be seen at the back of the packet right at the bottom. To be honest, I have never liked this method and I don't find it as efficient as compared to the "touch and feel" process. Likewise, I have applied this primitive method over the Series 3 and have gotten over 95% hit rate based more than 200 attempts. At this current moment, I believe there is no readily available copy of the official dots for Series 4. I can't promise that I am able to have additional time to share the codes or to compare further with the similar packets which I have mixed it up by mistake but I will try my best to see what I can do. More importantly, I am also unable to determine where my box comes from but I will like to safely assumes that it comes from Europe, unless of course it could or may have come from the United States and ship it over to Europe for distribution for the first release. If you have seen the recent British cartoon movie, known as the "Gnomeo & Juliet", then you will understand why I used this adjective. The Lawn Gnome is also known as the Garden Gnome, where it is like a mini dwarf that supposed to help out in your garden at night. To many British residences, this is widely used as a decoration in the garden in real life. Whereas, in LEGO fans context, this Lawn Gnome can be placed at the front of the Creator House, 6754 Family Home (for example). For myself, I will use it like the typical Fisherman in Series 3 as a fishing companion. So, what do you think of the Lawn Gnome without the beard on? The Lawn Gnome's parts is quite similar with the Series 3 Fisherman. The notable differences are the missing fish, pointy hat piece and short blue legs. I did wish that it comes with any kind of colour fishes for hooking onto the rod. The traditional Kimono originates from feudal Japan and is mostly worn by women. Her white make-up and red lipstick along with the red cloth and pink sakura flower patterns prints did initially remind me that it was a Geisha. It is certainly nice to see different cultures being introduced in this series. 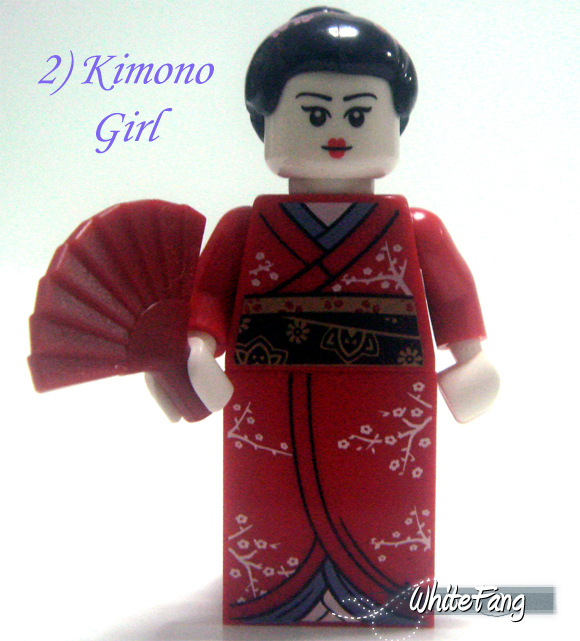 It is uncommon to see such exclusive oriental female minifigure being made available in LEGO and I am fairly certain this could be one of the popular female minifigures. Imagine the endless possibilities of the use of the kimono. Furthermore, there is a back printing at the Kimono's torso which certainly adds more value into the design consideration. From this angle, you will be able to spot some nice details including the bundled hair piece which have some flower prints on it. In addition, the red ornamental fan is also a nice accessory to look out for. The suave musketeer is very likely to be one of the highly sought minifigure in Series 4 based on our Eurobricks Community Poll feedback. 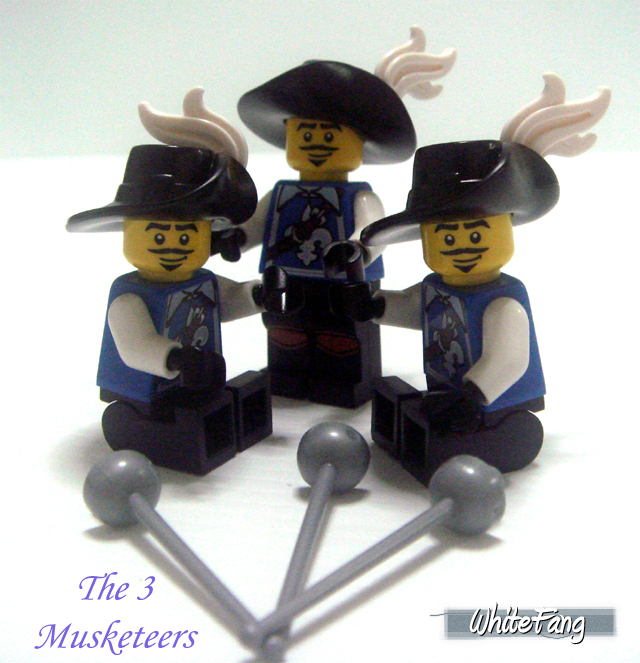 The musketeer is supposed to be a solder, equipped with a musket but I am very certain that this minifigure was actually inspired by the famous novel, "The Three Musketeers". 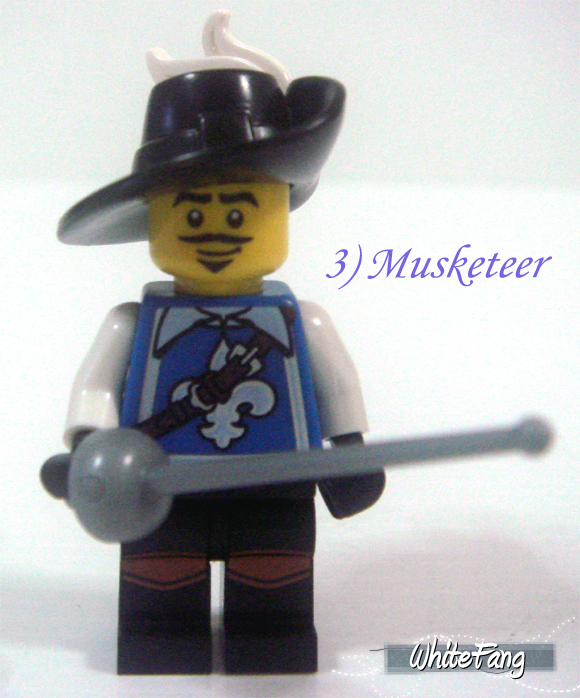 The musketeer is one charming minifigure with the complete outfit and the iconic cavalier brim hat and rapier is some items which can be used to associate with a musketeer. I love the entire parts assortment in here. The new black cavalier brim hat and rapier are going to be popular accessories among the Castle and Pirates fans. For many years, these fans yearn for the new accessories and now it has finally materialise. I also believe that the new white plum is also in the new colour and can also be used with the rest of the plumes in the Castle Kingdoms theme. I love this group shot! Certainly reminds of me "The Three Musketeers"
This Punk Rocker knows his attitude and style by differentiate itself from the typical norm. He certainly has the cuts and could likely turns out to be a great rock electric guitarist member in the LEGO Rock Band video game. You might want to take a closer look at the side of his pink Mohawk hair. Take a closer view of his torso. One way or another, I felt it is kind of related to Guns N Roses. 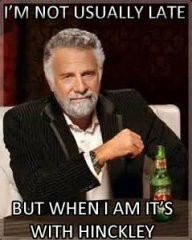 I am not sure if I am inferring too much though. This is another one of the better new parts assortment including the pink Mohawk hair and the black silver electric guitar. That is definitely one of the most amazing official LEGO musical piece made available so far. You could easily see the amount of details being put together in one small element. There is a piece of good news for this Punk Rocker and you will need to read on to find out. I can give you a clue and it is the "distribution quantity". 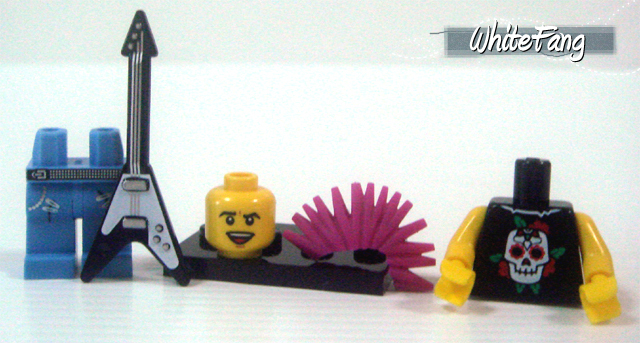 The musically talented LEGO artists releasing their first hit single - "Brick Fever"
OK! Let's see a show of hands! 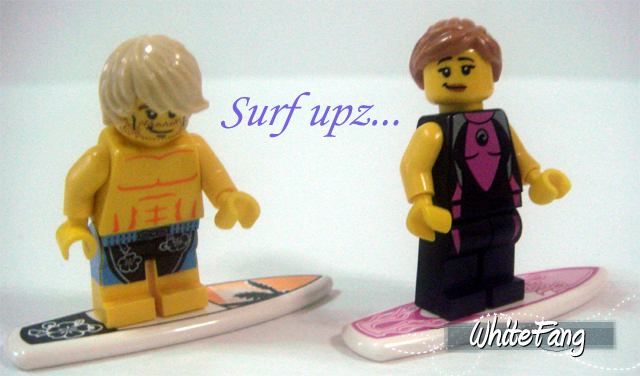 Who doesn't like the cool Surfer Girl. I could see a handful. 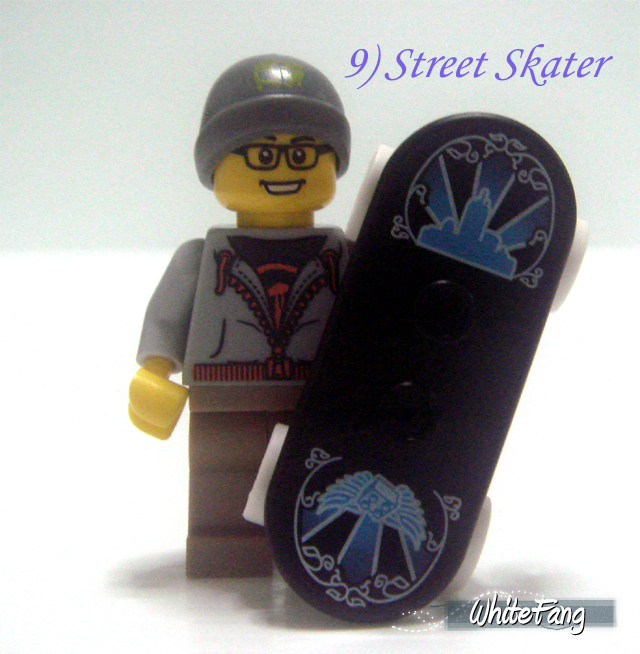 I had seen people complaining include the Street Skater which I will cover later, that the minifigure concept is no different from the earlier series. I beg to differ. 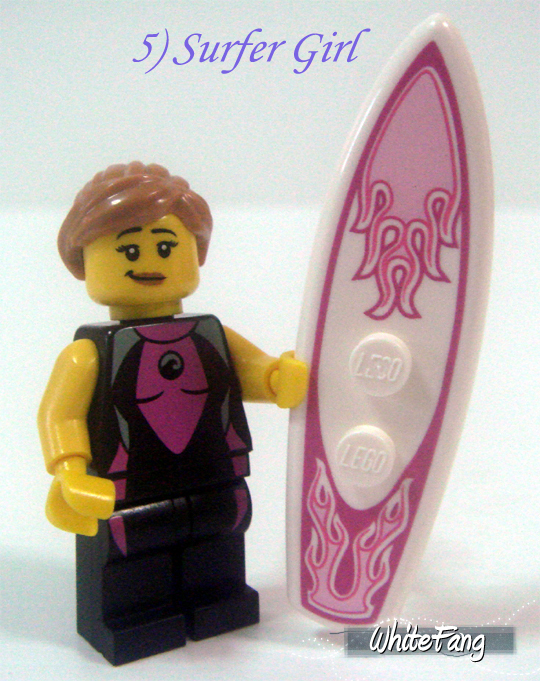 This Surfer Girl is certainly a great companion for the Series 2, Surfer. It adds in the fun of combining different personalities of a similar settings together. I remembered people also ask for some different kind of surfers and this Surfer Girl is definitely a welcoming addition. It comes with the standard surf board but this time it is printed with fiery pink flames. The black surfing outfit is also suitable for the deep contrast between black and pink. 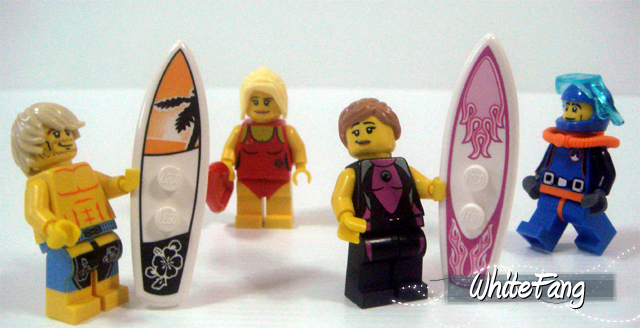 I could certainly needs a couple of this new female minifigure in the beach. Who could ever forget the Nordic fearless Viking! 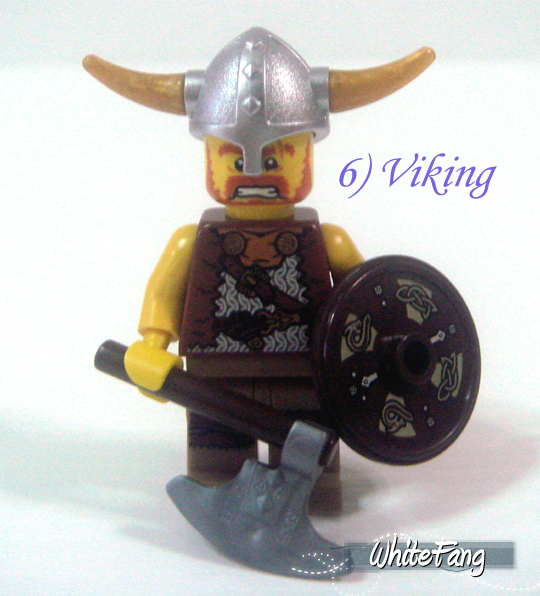 The LEGO Vikings theme was first seen in 2005 to 2006. It was the first time ever to introduce a Nordic culture into the medieval settings. And, this time we are seeing this Viking warrior again in Series 4. It retains the rugged looking expression and uses the same helmets like before. I could think that it will be a nice expansion into your existing Viking collection. 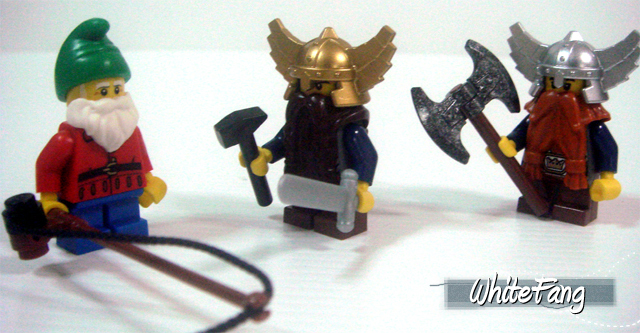 I would love to add a comparison between both but my Viking minifigures are all kept somewhere beyond mine reach. 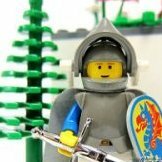 Although Vikings is not a widely popular LEGO medieval theme but I am very certain that this minifigure is going to be a huge target for army builders including myself. To re-ascertain the value of this warrior, the most valued element is actually the printed Viking shield. The LEGO Viking sets do not come with any printed shields and it is mainly make up of stickers which does not last in the course of time. Mine have peeled and it is in a very bad shape. Even though the weapon and helmet are of a different quality but having to see a new warrior like this will helps to re-create a new battalion in the Viking regiment. 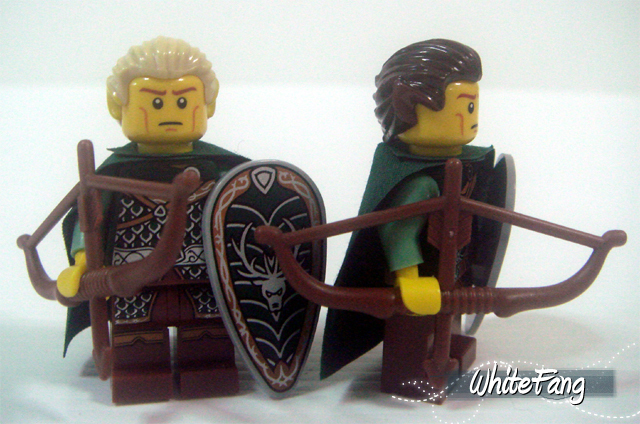 Let's hope and pray that this minifigure will not be as hard to find compared with the Spartan and Elves. This image does not really relates closely with one another apart from the closely knitted settings happening in ancient medieval era where different warring cultures clash with one another. 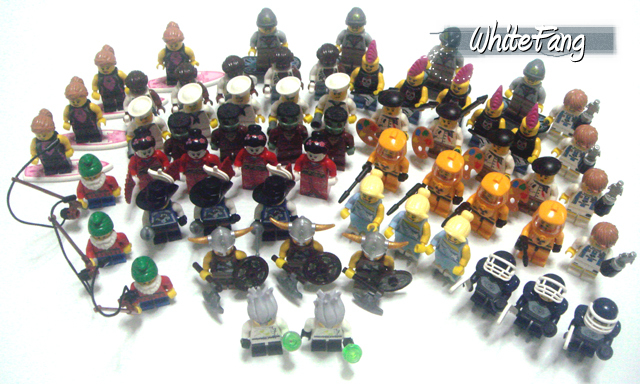 Personally, this is just a group image of mine favourite sought medieval minifigures in this Collectable Series. Does it reminds you of something? Why am I typing so much in this section? Perhaps I have found an use for my theme integration. 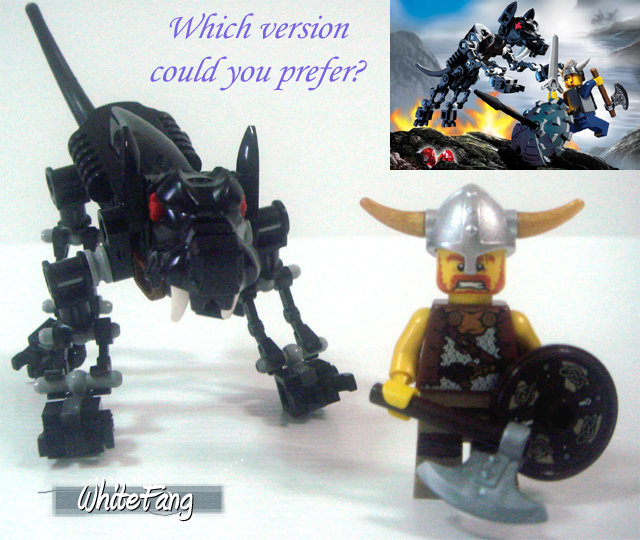 Let's compare with the LEGO 7015 Viking Warrior challenges the Fenris Wolf and this new version. Which could you actually prefer? I will leave this for your thoughts. Can this Viking Warrior stand against these legendary Fenrirs? This ugly looking Monster, more commonly known as Frankenstein, a hideous looking creature. 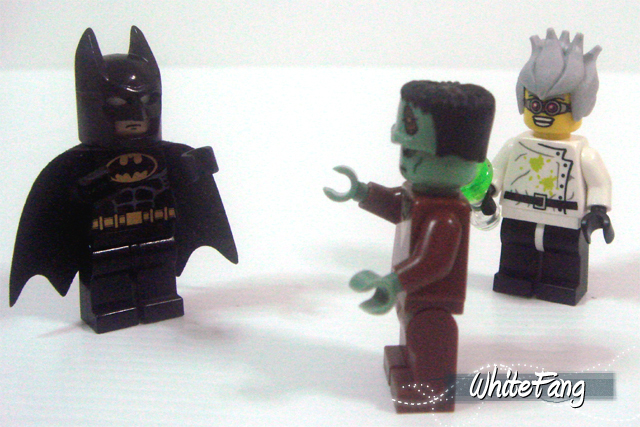 LEGO first introduced the first Frankenstein under the LEGO Studio theme in 2002. For collectors like myself who missed this first generation Frankenstein should feel happy to be given an equal chance to own this new re-make classical monster in Series 4. Apart from all of the iconic distinct "Frankie" parts like the head and body, I really wished there is something for him to hold. It looks so empty, leaving his arms bare. Give him a chain or even a teddy bear. I don't know where I get that idea from. Anyway, Frankenstein supposes to scared people by moving towards them lifting both their arms and shouted "garrrrr". It is so beautifully nasty when you put all of the monsters villains in a group image. 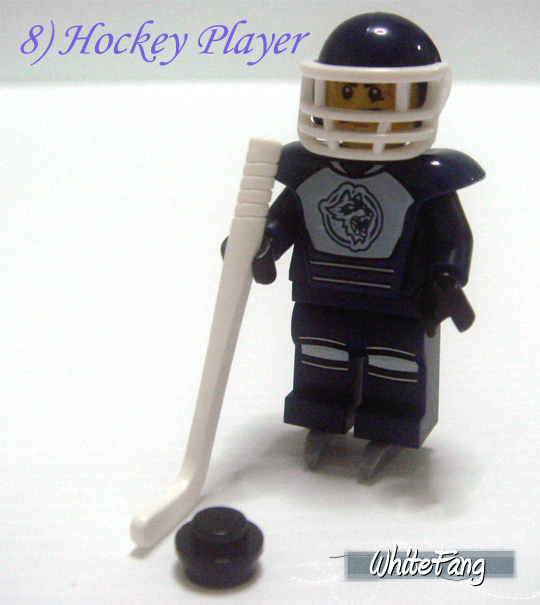 Fans of National Hockey League (NHL) will now have the rare opportunity to assemble a team of icy fast thinking Hockey Players in your LEGO ice skating arena. Ice Hockey is one of the popular competitive sports category in cold climate countries. This Hockey Player arming with its "armoured" looking gear is ready to take on the rivalry team. Do note that there is a back printing behind its gear. A couple of new interesting parts like the hockey gear suit to protect the physical body. To make the gear suit looks unique, it even comes with a howling wolf printed design. 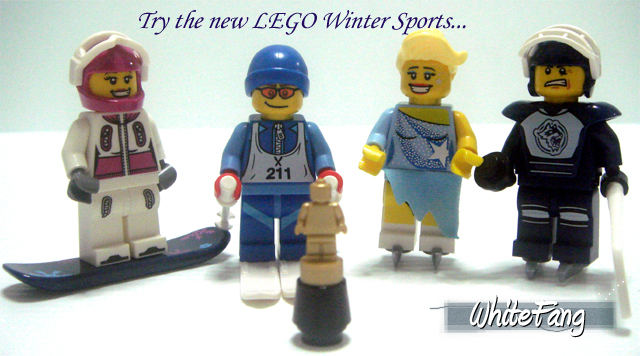 Furthermore, the new hockey stick, visor and skates are some new useful sports equipment for our LEGO minifigures. There are many people felt that this action Street Skater is a redundant and is merely acting like a filler. I don't see it this way. In fact, this new Street Skater could be better than the predecessor. Can that be even possible? Yes, it is. 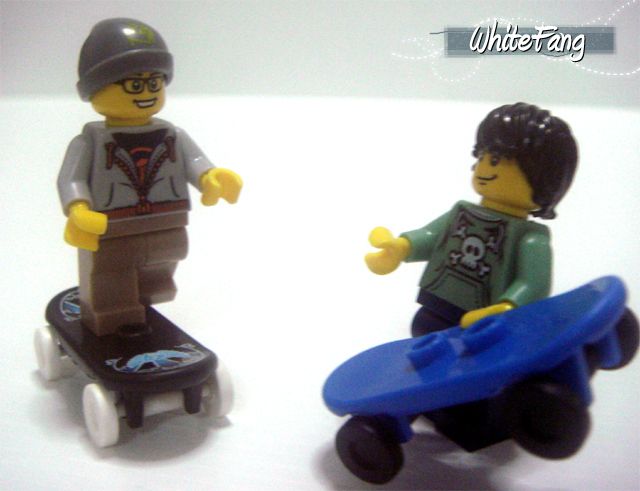 The amount of printed parts made available in this design exceed the previous similar version of Series 1, Skater Boy. There is a back printing behind the torso revealing the hood. This is a picture of him standing on the skateboard. This parts assortment is filled with printed parts including the dark blue skateboard with two different brick prints on both ends. The grey beanie also have a printed lime green brick at the front. I don't think we have ever seen a skateboard with printed designs by completely excluding the use of stickers. This is going to be a good reason for me to stock up those new skateboard designs. Hey dude! Let's perform some stunts! Ship ahoy! This is the modern smart looking Sailor which can be found on naval deck. 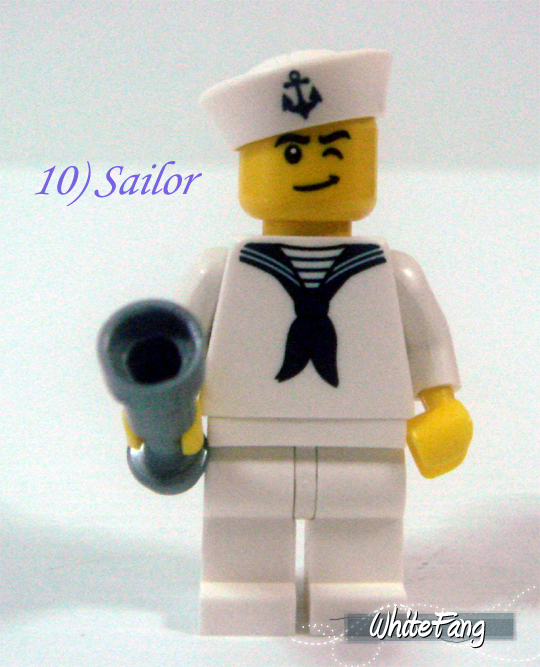 This Sailor's design is absolutely accurate right from the top to its torso. I could never thought I can ever see such an accurate design of the sailor's cap. Even the facial expression made you felt assured to know that having him onboard will guarantee a safe journey. This Sailor also comes with a detailed back printing at the torso. This is not the end-results of a good laundry. Instead, this complete clean white parts is part of this Sailor's outfit. It even includes a trusty telescope for looking at far distance. Why do I always pair up with the weird looking Captains? Finally, we have a decent looking professional Soccer Player whose outfit is remarkably similar to the real football clubs. Apparently, for this player, Octan seems to be the main sponsor for this soccer team. I wonder if it actually relates to any FIFA World Cup resemblance who have won the silver trophy and I can't help but to think it was Argentina. By the way, the jersey also comes with back printing and legs printing on the side. This is a decent parts assortment especially if one needs the silver trophy. 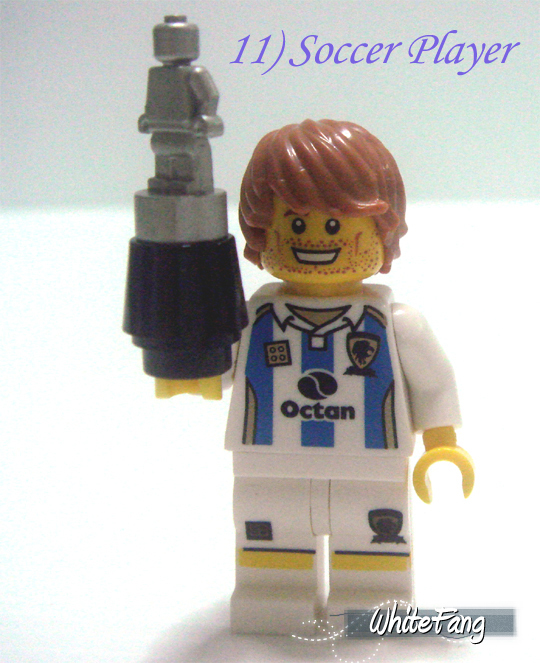 How I wish this minifigure includes a soccer ball. It will be absolutely perfect. Just a little more to make this minifigure priceless in my rating bar. 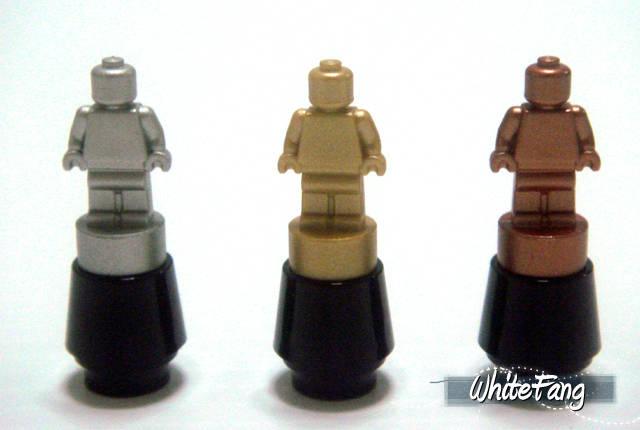 If you have been a dedicated Collectable Minifigures collector, then you should have all 3 trophies being placed together by the end of Series 4. It is remarkable to see how 3 different series could bring altogether as one related accessories combo. Let's smile for our group picture! 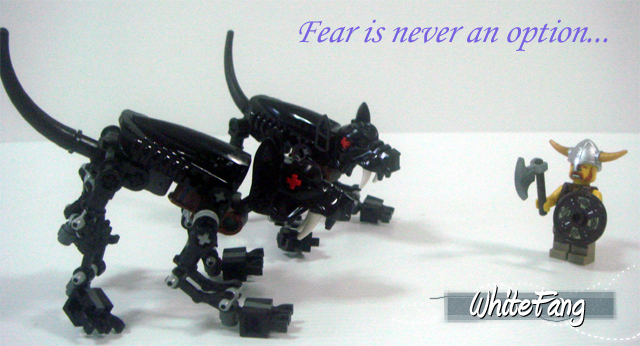 LEGO brings us again another re-make classical monster. This time, the new transforming Werewolf is so much better and intimating than the one which is released in 2002. Every little bit of details is captured in this minifigure including the ripped shirt showing the differences between both arms on its eluding brown furry body. Even the eyes itself can appears taunting. Werewolves fans will be in for a treat as I got a gut feeling that a handful of you will be rushing for this minifigure. My advice, don't be rush to get it. I believe there will be plenty for everyone of us. For myself, I am also interested in this, but it is mainly for the hairpiece and dog bone. I think we could also substitute the werewolf headpiece and placed it under the LEGO Boardgames, Monster 4. This is a very good reason for one to buy this minifigure. You could get an exact same elf hair design coated with a different colour to further customise your Elves armies. I will not want to miss on that, especially not knowing when and where will this hair piece of a different colour be made available. Only time will tell. Who will keep the prize? Radioactive meltdown or hazardous clean-up? Who do you call? 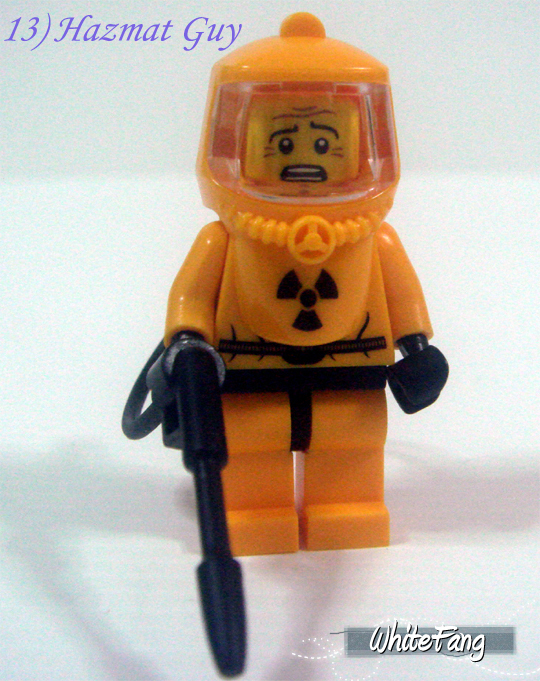 It is none and only but our first Hazmat Guy who is trained to deal with such delicate situation. Even though he might be trembling behind his protective suit, but given the nature and risk of his occupation, it is no wonder why he is suffering from occupational hazard. 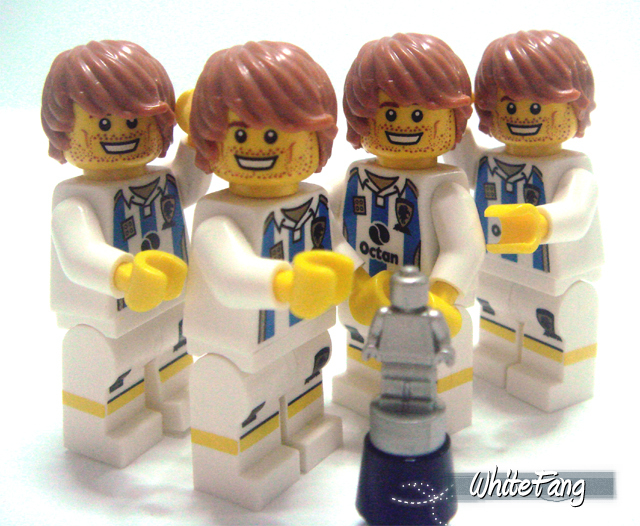 Do note that this minifigure is highly receptive and is highly sought for as well. In fact, if I remembered correctly, based on the Eurobricks Community poll feedback, this is the only minifigure which have toppled the remaining 15 minifigures. The new radioactive protection suit is to ensure that safety for the wearer is well taken care of, so he could focus on his job to clean up the contaminated scene. The sprayer can be attached at the back of the suit. The imaginative Artist who colours the world with vivid colourful paintings of sceneries and drawings. Every colourful bit of colours from the palette. Even though he is out of canvas, he will never fail an artistic location to release his art through his paint brush. Definitely one of the important introduction to your City civilian population to loosen the grim atmosphere. Unbelievably detailed. Just take a look at the amount of different colour spots found in the torso and legs. The colour palette which consist of red, green, blue and yellow and paint brush dip in green paint are visually spelt out. Too bad, the paint brush cannot be inserted into the colour palette. 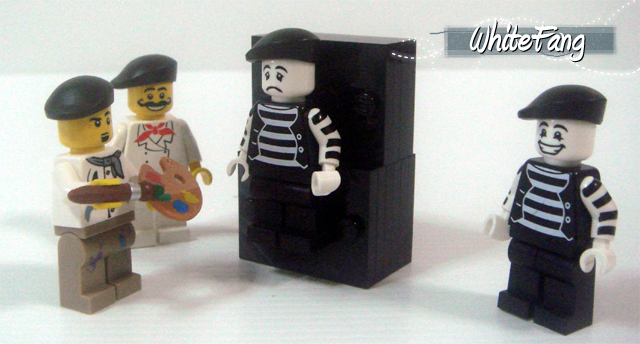 Can the Artist captures the right expression of our Mime? The beautiful elegant Ice Skater whose move like a ballet dancer but takes her art to a icy new height. Fitted with dazzling sparkles made her shine like a star. There is a couple of nice details such as the back printing and the half cloth which surrounded her waist. 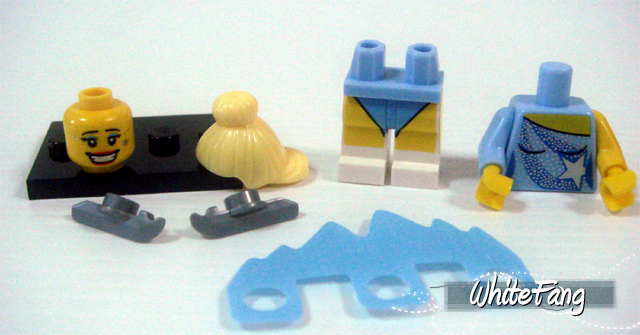 A good decent parts assortment which is very much suitable to place her in the LEGO 10216 Winter Village Bakery set. It will be a nice ice skating arena for her to practice and perform. 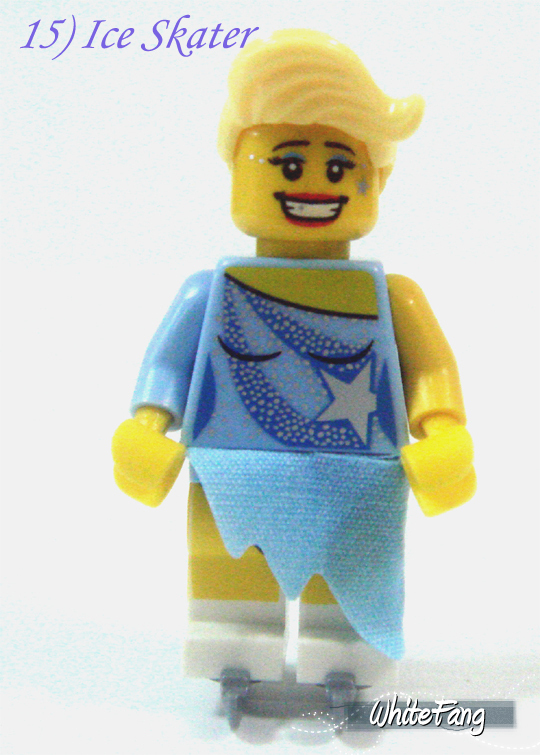 Her bundled hair piece is a nice looking female hairpiece for us to utilise with other female minifigures' designs. The evil Crazy Scientist is out to ruin everyone! A selfish mind like himself experimenting with science. I could not want to find out myself personally what's in the lime green liquid content inside the beaker. When I first opened this packet, I did not realise it is a beaker until someone pointed that out for me. Actually, thanks to KielDaMan for pointing out the right definition. It is supposed to be an Erlenmeyer flask instead of a beaker. How embarrassing of me. The parts assortment is quite decent. Do note that the new grey hairpiece is rather soft in texture. This is not a very interesting minifigure but I can very much assure that this minifigure will be the ultimate rare finding! 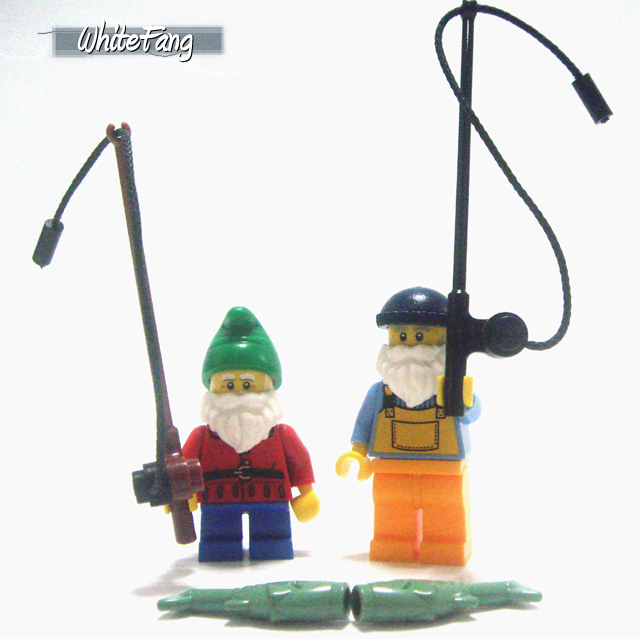 It is the Fisherman's equivalent and I am not surprised that this minifigure will go missing due to its rarity factor but to be honest, the appeal factor doesn't hit onto me, so we will leave it to the market forces to decide. Batman's latest foe, the "Crazy MAD Scientist"! 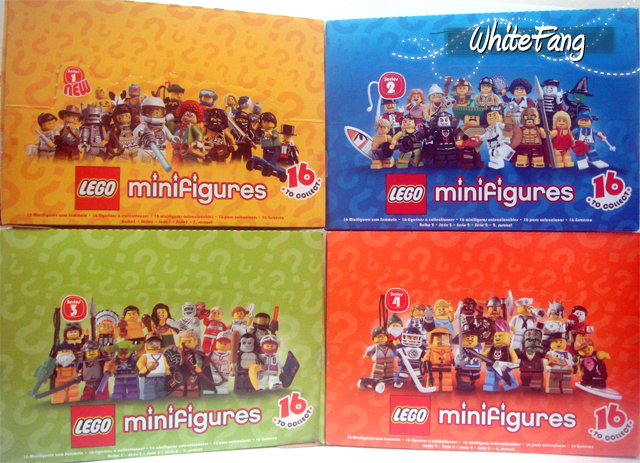 So, what do everyone feels about the current LEGO Collectable Minifigures Series 4? 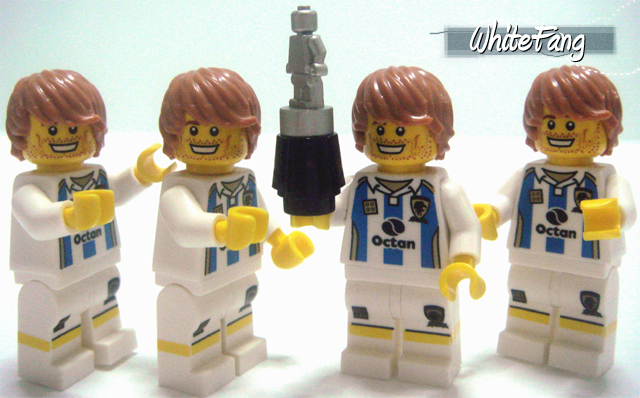 Did it live up to everyone's expectations and proclaim to be one of the highly rated minifigure series so far? In my opinion, I support all of the LEGO Collectable Minifigures Series. I have practically lost count of what I owned in my collection so far and why is this so? Well, there is something very special in all of these series which made me buy more without me realising it and I really believe that it is the magical unique concept that made this theme as one of my primary core LEGO theme in my collection. 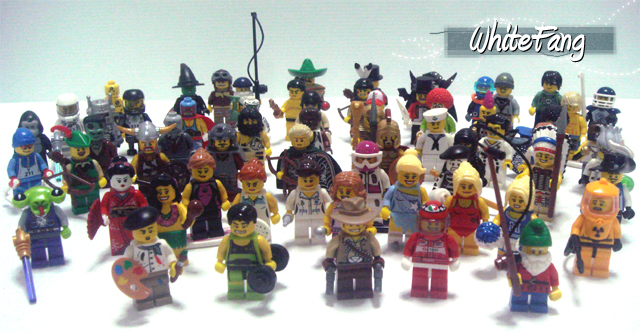 I have spent lots of time and effort to hunt for these minifigures and took an extra step to share complete reviews. All in one name, I am really supporting them from my bottom of my heart. There is no doubt about it. When Series 1 is released, you find it adorable and innovative and Series 2 adds the continuation, while Series 3 adds the flame and upon Series 4 arrival, you could soon realise that all of these are meant to integrate one another, someway somehow. I may have repeated myself all over again in my past statements and I still stand by those words till now. All of the 64 Collectable Minifigures so far are truly innovative and have definitely brought many new LEGO elements in our building. Though the quality might differ from the regular minifigures slightly, but the amount of details and new parts being brought in a specialised collection, you could see old and new LEGO fans being formed. 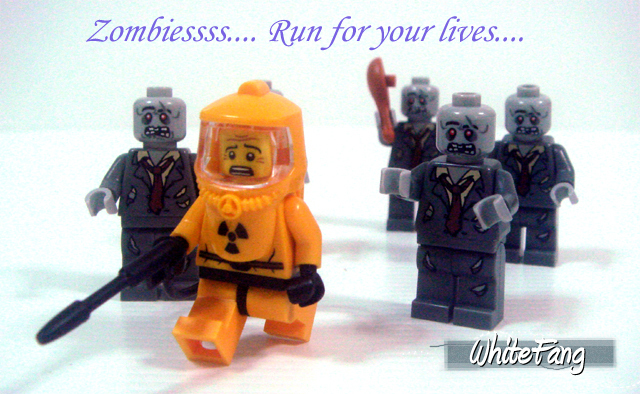 As it is, I hope I am still buying at a rational level of the highly sought collectable minifigures. Once again, another collectable minifigure is missing from the group picture. Can you spot which one is missing? 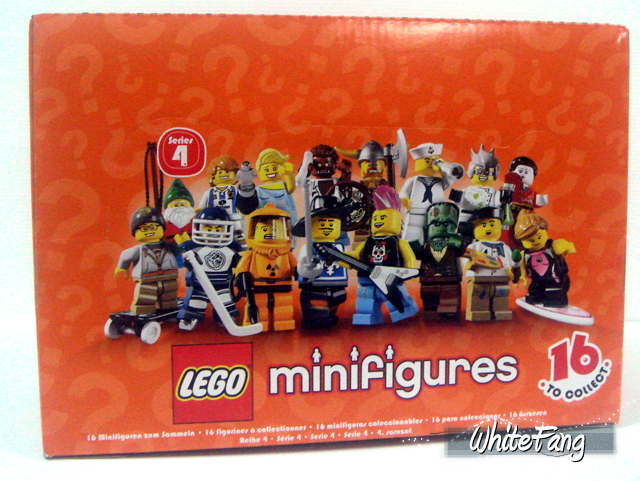 Considering the probability based on 32 packets, the probability of grabbing one unique minifigure is 6.25%. When you factor the remaining 28 spares into the equation, the low (3 minifigures in a box) and lowest (2 minifigures in a box) tier which consist of 6 unique minifigures are only available at 17 out of 60 packets and this translates to 28.3% in total and 1.66% each, which makes it even harder to achieve by just doing it randomly. Likelihood, this percentage will be lowered by at least half due to the introduction of the dotted system and fanatic LEGO hunters. You might notice that among the previous 3 series, this is the first time where the medium (4 minifigures in a box) tier is on the relative higher end than before, by offering a total of 7 unique minifigures. This measure will definitely help to iron out the popular minifigures by giving it a better spread for this tier. Furthermore, the probability of getting the Punk Rockers, Sailors and Werewolves are on the higher frequency note and went back to the same distribution curve in Series 1 and 2. Since they are now currently made available at 15 out of 60, this will translates to 25% in total and 8.33% each. Even though for the previous Series 1, 2 and 3, the highest probability happen for this tier remains 8.33% but it will be better than Series 3 distribution where TLG introduces 4 unique minifigures distributing at 20 out of 60. To conclude, the LEGO Collectable Minifigures Series 4 is no doubt one of the highly rated minifigures assortment ever, with plentiful of new and re-make designs being introduced. There is a very minimum usage of filler being used for this Series, and more importantly, the current distribution is slightly better than before, despite of not having to complete at least 3 complete sets when you buy a full sealed box. I am really hoping that the Crazy Scientist is not the next Fisherman. Overall, I am extremely satisfied with this current series. 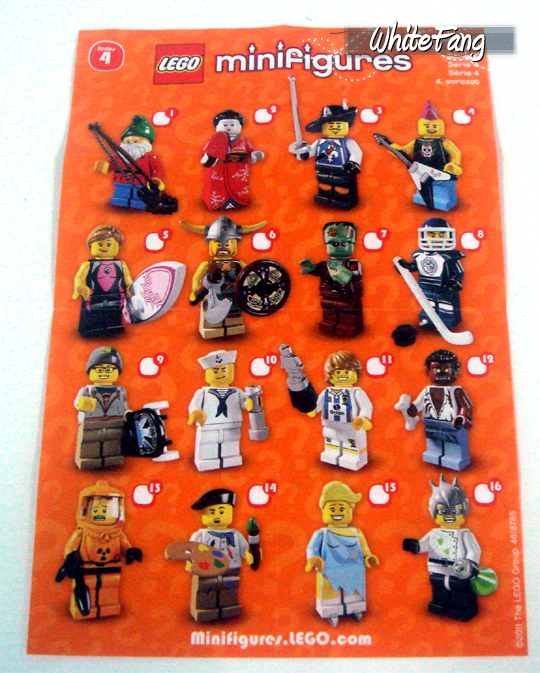 The Viking, Hazmat Guy, Musketeer, Surfer Girl, Kimono Girl are some of mine favourite Series 4 minifigures ever. Last but not least, as mentioned in Series 3 review before. I wasn't really expecting to see the existence of spare parts. It appears that the placement of spare parts is removed from Series 3 onwards. It is really a pity but there is nothing that we can do. All I hope now, is to see roaring success of all LEGO Collectable Minifigures Series 1 to 5 and pray that we could see Series 5 and beyond. Thank you Whitefang for this review. The series 4 collection has to be my favourite. Thanks very much for this excellent review. 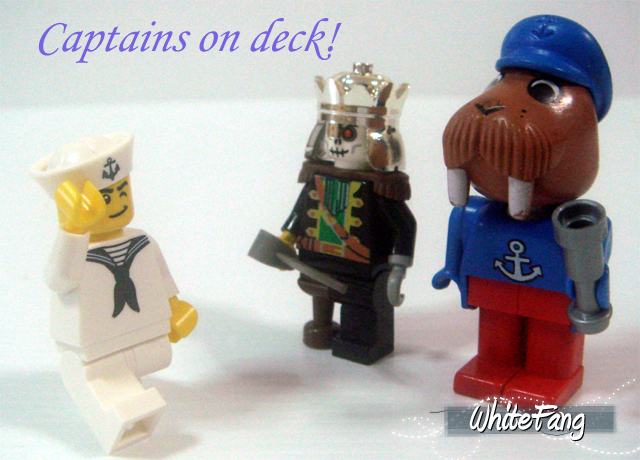 Whitefang!I really like all the figures, and I can't wait to get them! Thanks again for this very speedy and thorough review. Second, I must admit that I think this series is the best so far. After the mediocre third series a new high for this collection. I'm looking forward to pick these up, at least two of everone. Good gracious me, what a great deal of work you put into that review! Fantastic, thank you so much! I so can't wait to get my paws on these. I love all of them, honestly. Disappointed with there only being 2 full sets, hopefully this will be remedied like with series 3s fisherman situation! Not fussed for loads of the mad scientist but the bottles would certainly come in handy, with such poor distribution (If it does stay at 2) will only push the secondhand prices up on BL. Also wondering why they've stopped including extras after the 2nd series? Lose one ice skate & you've lost what the figure is, especially with the figure skater. A sticker sheet in with the footballer would've been a nice touch too with numbers from 1-15 which would've encouraged kids to go out & look for a larger number to get a full team. My faves of this series are the painter & skateboarder. Now we need to wait before this series to become available. Thanks for the very detailed review! Thanks for the review Fangy. A great assortment of figs indeed. TLG seem to deliberately only put two full series in a box these days to make reselling these in complete series a lot hardermore expensive. The figs that are represented in larger quantities are pretty good though this time. I'm now more than ever willing to buy one full box. Just by seeing them all and the numbers are great. Always wished for 3 Musketeers. Only just wished for more Garden Gnomes, think of Snow White and the 7 Dwarfs. And less Werewolfs and Sailors, but I was expecting that. In other words just great, can't and may not complain. Is it me or has this serie way more back printing and more details?! Now, after reading this review, I REALY can't wait to lay my paws on a box and start opening the bags and assemble those minifigs. Agree with escortmad79, it's a shame they don't try to at least make the distributions as even as possible (which would mean nearly four complete sets). I understand some will be more popular than others, but they don't seem to be concerned about it and, in fact, it seems like they try to make the ones people will want more of less common... good for them, I suppose. Anyway, after seeing the review of the werewolf the other day I had exactly the same thought about using it for elf hair; in which case I would want a lot of werewolves just for the hair. Dark elves... Drow... either that, or use nail polish or something to make the ears yellow. I'm very excited about the "Kimono" Girl... I think she'll be great for MOCs with the Samurai, although with the painted face I would think she would be better named "Geisha." Don't know why the Gnome has a fishing pole, but whatever. I would like extra Kimono girls for MOCs involving the Samurai, but not necessarily the Sumo, and I don't recall Ninjas having women dote over them like Samurais would have. Hazmat guy, Frankenstein's monster, the scientist, the wolfman... I have some neat ideas (I think they're neat, anyway) for motion picture themed MOCs. Need a few more cameras, maybe. 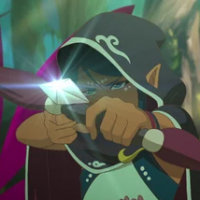 Overall, while the elf is still my favorite, this series definitely has more characters that I want extras of - I guess it has more possibilities, IMO. Great work as always Fangy! Boy this looks like the best series yet! Thanks for the review, Whitefang! If the Gnomes face was blue, he'd sorta look like Papa Smurf. I love his torso and hat as well. So after seeing more pics still my favorite. I'm also glad the Sailor is common. His winking is a great expression along with the sailor uniform. I don't think they do that at all - quite the opposite, in fact. One just has to remember the primary market for these things is still kids around ten years old or younger. They're simply not going to prioritize them the same way adult fans do. And regardless of whether one thinks TLG has absolutely zero concern beyond making profit or actually wants to please its customers, they simply have no reason to try to make the most desirable figures more or less rare in the way you're describing - after all, regardless of which figures they produce more or fewer of, they ultimately produce a certain given overall number of figures for each series, and they will sell them all regardless of what the mix is. I suspect they try their best to gauge overall demand for each figure and balance the box assortments accordingly, and the numbers just seem strange to us AFOLs. 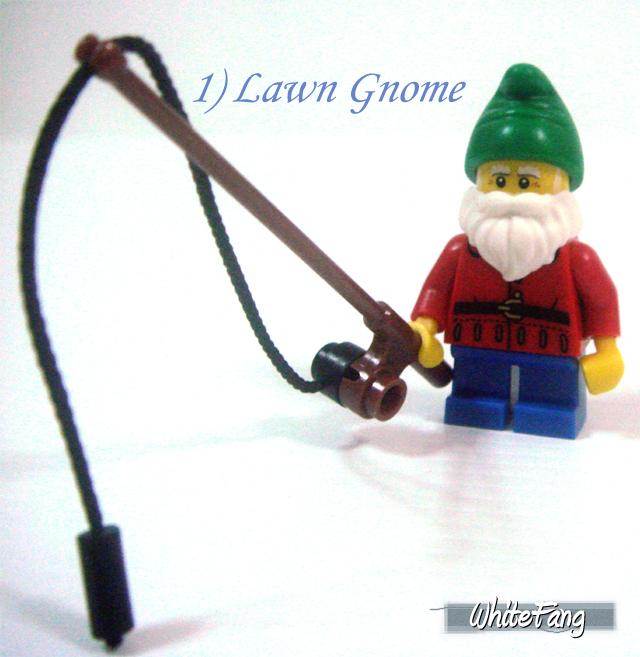 Garden gnomes are pretty commonly depicted with fishing poles. Ah, fantastic, the Punk won't be hard to obtain. The gnome also has a rather nice looking torso print, perfect for a more well off peasent in Castle. Yippeeeeee!!! Finally, a close-up of the hockey player! Now, would anyone like to supply me with a bunch of NY Rangers and Colorado Avalanche jersey stickers? Oh, btw... - thanks for this awesome review Fangy! It's a weird fact for the (Frankentein's) Monster that he has notting to hold in his hands. Just like the zombie had even 2 things, a shovel and turkey leg (since when do zombies need tools?) Or what about the Mummy, he even got a scorpion. And in this S4 the Werewolf got a bone and the (Garden) Gnome got a fishing rod! They could atleast have giving him something like a chain (or chains), just like WhiteFang said. Or maybe a wrecking ball on his ankle?! Still he looks way better IMO than the Lego Movie Studio version ('the very 1st Lego Frankenstein'). I could mix him up with other parts just to make some nice weird monsters of my own. One thing you failed to mention about the lawn gnome as a point of distinction from the Fisherman is that he has a Reddish Brown fishing pole rather than a black one. The Crazy Scientist's hair isn't really a new piece. 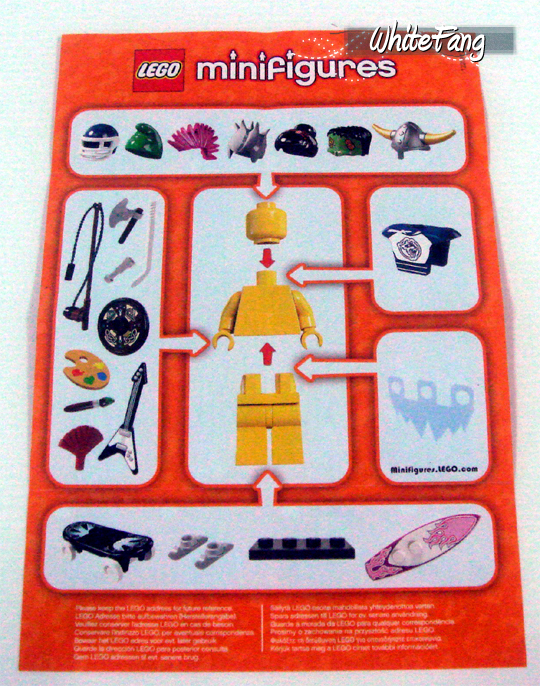 This rubber hairpiece was used previously in the Dr. Inferno and Dr. D. Zaster minifigures from the LEGO Agents theme. This is the first time the hair hasn't been printed, though (Inferno had black hair with orange highlights, and D. Zaster had white hair with lime green highlights). 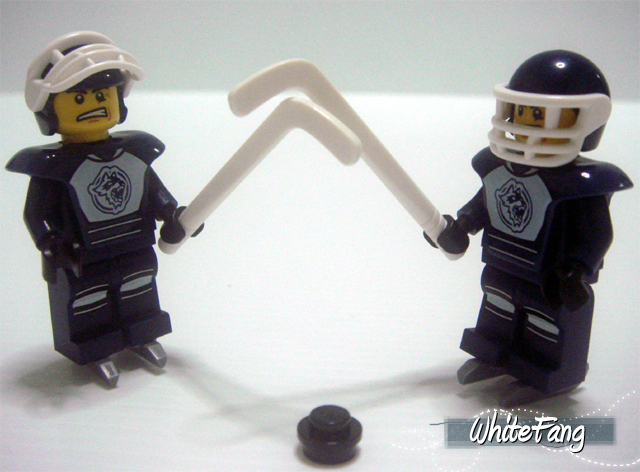 The Hockey Player's armor isn't new, either-- the minifig-scale ice hockey sets included it. On the other hand, his helmet is definitely new. Is the trophy tan underneath like the past two trophies? Not like it makes much of a difference, but I'm just curious if that's the "base color" for all lacquered parts in the Collectible Minifigures. Anyway, I'm sure people will complain to no end about the fact that the vikings and musketeers are 3.33 percent rarer than the most common fig (the punk rocker), and I'm sure some people will assert that those two (along with the Sailor, the third "army-building fig") should be around 12% more common than any other figs in the box (don't ask me what makes me think that... ). Still, I'm happy to see the ratios are fairly balanced, despite the slight deficit of crazy scientists. The fig I'm least impressed with in this series is the Viking. He took the horned-helmets idea (historically inaccurate, but not breaking willing suspension of disbelief), but then went and made the horns gold (definitely breaking willing suspension of disbelief, at least on my part). I'd much prefer if he'd used the cow horns that have come out since the original Vikings theme as a point of distinction from that theme. And for that matter, they could have made them some obscure color if they really felt it was necessary-- just not gold. It's not just an issue of realism for me, either-- having two metallic colors concentrated on his helmet and none anywhere else besides his weapon makes the helmet just feel like overkill. Hard to say which fig is my favorite, but I do like the artist, the kimono girl, the street skater, and the punk rocker. Even though I tend to dislike the idea of "filler" minifigs (it makes it sound like the less-demanded figs are thrown in as an afterthought rather than having the same amount of thought and effort invested in their design as their comrades), but overall I agree that Series 4 has fewer figs that I don't feel any desire at all to get. Of course, it also has fewer figs that I feel heavily pressured to get than Series 3 (which had the lovely elf, Space Villain, and hula dancer, along with other charming figs like the Space Alien and Sumo Wrestler). This series is hands down the best ever. Can't believe it's almost here... I want hockey players and plenty of them!! I am all about the "touch & feel" method. I've done this with all the series and it's 100% accurate, unlike the dots. I can usually pick out what fig it is within 5-10 seconds. Series 4 already? I'm so jealous... But thanks for the thourough review WhiteFang . I'm really happy to see that so many of these figs have back printing, it makes them so much better for MOCing, as they will look good from all angles (not like the hideous back of the life guard for example). But it makes me sad to hear that there won't be 3 complete sets of figs in this series either . The mad scientist isn't my favourite, but the beaker is really cool... LEGO did however state that the reason there were only 2 fishermen in the first boxes of series 3 was because of a production problem, which was later fixed, so maybe this is the case here too. Would've been really sick if he came with a squishy little brain... and even better if the cranium opened up so you could pop it in there!! Sorry for possible slow loading of the pictures at this moment They are on an external server which doesn't seem to be equipped for the current amount of traffic. 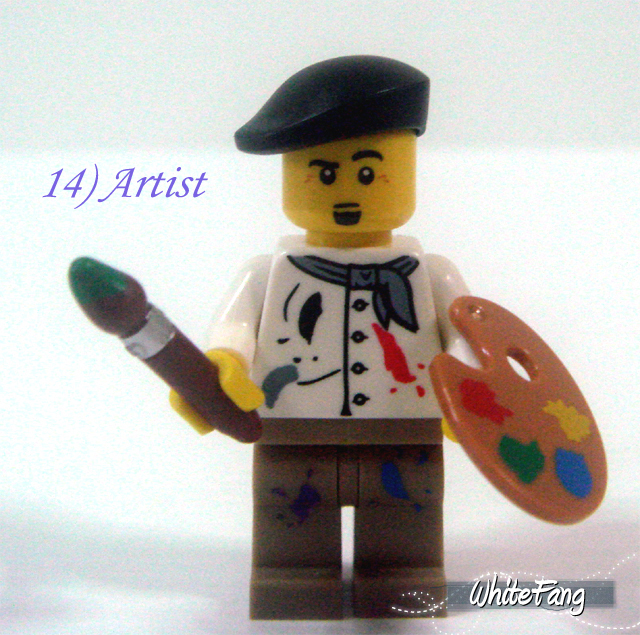 I've requested Whitefang to see if they can be move to the Eurobricks server (or Flickr). Another thorough, exhaustive process Whitefang, well done on giving the LEGO fans what they need to satisfy their questions. I fear as more series continue to come your scope will only get bigger! Great job mate, now go have a good lie down.